You may be wondering what the difference is between Single Opt-In and Double Opt-In on your forms. These two opt-in styles are both available with ConvertKit, though they mean different action is required on your subscriber's end so it's important to understand the difference. Let's dive in. By leaving the default settings of having that top box checked (the one that says "Send incentive / double opt-in email to confirm new subscribers"), you're setting up your form for a Double Opt-In process. The great thing about ConvertKit Incentive Emails is that the text is all fully customizable - so put your stamp on it! Change the subject line so it stands out, edit the button text to encourage people to click it, or even use that button to deliver your PDF, eBook, or other opt-in incentive. Simply toggle that Thank You Page selection over to "Incentive download" and attach your file. Once they click the button, they'll get your download AND be confirmed onto your email list. As you can see, the pros far outweigh the cons with Double Opt-In. Is double opt-in required in my country? Contrary to popular belief, a double opt in process is not explicitly required by law in any country, however it is strongly suggested by several countries, like Germany, which would require you to prove an opt-in in court, and a single opt-in is not proof enough. Canada also recently passed CASL, which requires the same level of proof of opt-in in court. And it's not just German or Canadian marketers that need to keep this in mind: the burden of proof is on the sender. If you have German or Canadian subscribers, you might consider using double opt-in to protect yourself. With a Double Opt-In, you get a few more options too. See the bottom of that page above where it says "Auto-confirm new members"? If you check that box, your subscribers will be automatically confirmed to your email list even if they don't click the button in the Incentive Email. Now, this option starts to lead into more of Single Opt-In process so let's unpack that. 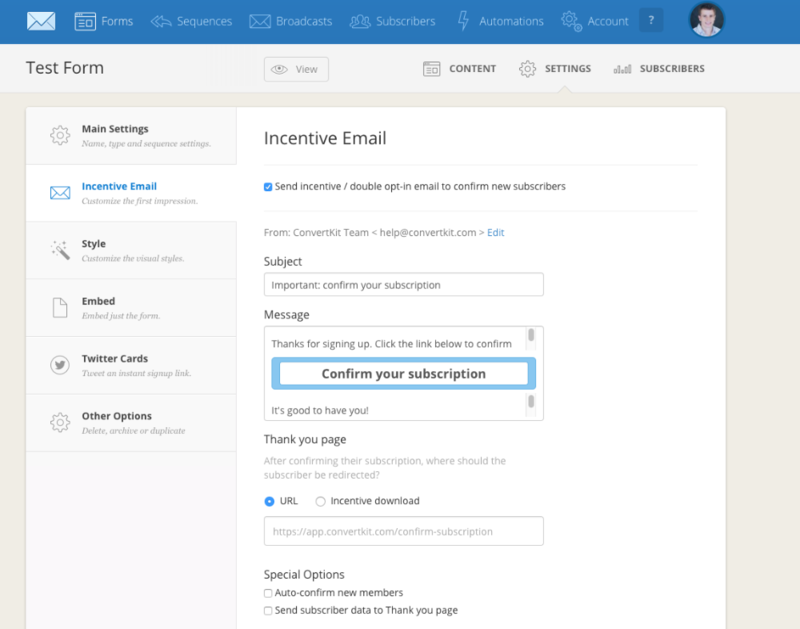 Simply uncheck the box at the top of the Incentive Email tab that says "Send incentive / double opt-in email to confirm new subscribers". This box is automatically checked (requiring a Double Opt-In that we'll review in a moment) so be sure to uncheck it and hit Save Form if you want a Single Opt-In. - did we mention spammers? We work hard to fight spammers on your behalf, but taking the precaution on your side to stick with a Double Opt-In will save you from subscriber error and potential deliverability issues down the line. Now that you understand the differences, it's time to setup a form!